Hand dermatitis is a medical condition characterized as a certain type of eczema and in some cases it may be rather complicated so that it requires special treatment considerations. It is also sometimes referred to as hand eczema. All the different signs and symptoms may come and go on their own. Still, hand dermatitis needs to be treated as soon as possible, before the symptoms become severe. The most common symptoms of hand dermatitis include deformed nails, pus filled lesions on the affected areas, crusting, painful sensations, cracked skin, itchy blisters, redness and scaling of the skin and dry, chapped skin on the hands. Hand dermatitis can affect persons from all age groups and it tends to affect women much more than it affects men. There are numerous different types of factors which can be held responsible for the occurrence of hand dermatitis. The tendency to determine a certain type of hand dermatitis may be inherited. Repeated use and exposure to certain substances may trigger irritation. Frequent washing of the hands removes the protective oils from the skin so it becomes irritated much easier. 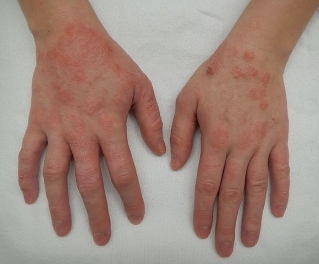 Hand dermatitis may be triggered by various different types of allergic reactions. Allergic reactions are triggered by different substances called allergens. The body’s immune system responds to these substances and is how an allergic reaction occurs. The most common allergens associated with hand dermatitis include topical vitamin E, rubber and nickel. Poor glove hygiene may also be related to the occurrence of hand dermatitis. There are also numerous risk factors which may contribute to the development of hand dermatitis. Various medical conditions such as hay fever, asthma and atopic dermatitis increase the risk of developing hand dermatitis. Different occupations such as metalworkers, painters, manual workers in chemical companies, caterers, chefs, bartenders, hair stylists and nurses are at an increased risk. Excessive amounts of stress may also contribute to the occurrence of hand dermatitis. Cold weather, low humidity and several other environmental factors may also be held responsible for hand dermatitis in some cases. Heavy perspiration may also lead to the development of hand dermatitis. It may be rather challenging to diagnose hand dermatitis properly and the procedure may involve various exams and tests. The treatment plan may involve tar, topical corticosteroids, antibiotics, topical calcineurin inhibitors, phototherapy and certain other methods. All the irritants and contributing factors need to be avoided as much as possible.